The school has a proud history of providing outstanding education for girls stretching back to 1874. Our girls achieve impressive results in every arena: academically, in sports, music, art and in drama. Most importantly, they are imbued with a strong sense of responsibility and a determination to succeed in whatever they choose to do. It all began in a very small way. Under Miss Dorinda Neligan, 88 pupils were on the roll when Croydon High School opened in September 1874. The numbers increased rapidly and some six years later 230 pupils moved to purpose-built premises in Wellesley Road, Croydon. The school’s first Head, Miss Neligan, was a formidable character who had served with the Red Cross in France during the Franco-Prussian War in 1870 and legend has it, had been left in sole charge of the wounded at Metz. She remained Head of Croydon High for twenty seven years and after retirement, so incensed at the long delay in giving women the vote, she became a militant suffragette. On one occasion, she protested by refusing to pay her rates and on another she assaulted a policeman but escaped prison presumably because of her age! We like to think that this sense of justice and equality of opportunity has been passed down through the generations of Croydon High girls – although we always stress the importance of operating within the law! The school has always been at the forefront of creating opportunities for girls. 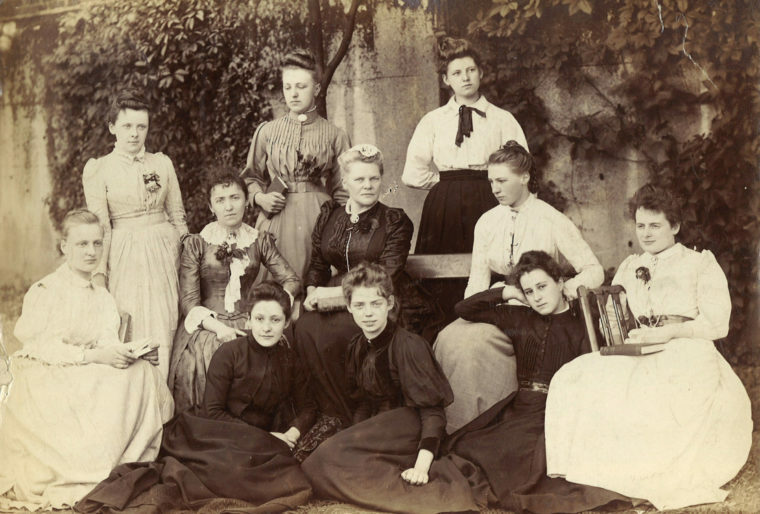 In 1885, hitherto almost unheard of for girls, chemistry was introduced to the curriculum. Of course, at the beginning, no practical work was allowed – it was far too dangerous! But the attitude to experimental science was changing, and in 1902, about a year after Miss Leahy succeeded Miss Neligan, a science demonstration room, forerunner of the laboratories, was built. In the early days, Croydon High girls did not wear uniform and photographs show them very decorously attired in the fashion of the time. By 1896 moderately short skirts were allowed for those girls who attended Swedish drill classes. Even in 1918 the gym mistress was requested to wear a long raincoat over her tunic when moving around the school! Hemlines go up and down but our girls are encouraged to wear their uniforms with pride always remembering that they are ambassadors for the school wherever they go. During its first quarter century the school had moved from its original premises; during its second the new premises were extended greatly and survived the First World War. The jubilee was celebrated in 1924 and with the third quarter century a new era began, under the headship of Miss Ella Ransford. This period covered the thirties when there was high unemployment and financial difficulty in the country as a whole; it saw the rise of Hitler and Mussolini and again the clouds of war. Miss Ransford retired in 1939, having established the School Scholarship Trust to help with the continued education of girls, initially those who had left school. When Miss Adams arrived to take over the leadership of the school, the Second World War had begun. She had just evacuated the Queen Mary High School from Liverpool and travelled to Croydon to find not 800 but 54 pupils, for many girls had been sent away to safe districts. Miss Adams had to act quickly to preserve the life of Croydon High evacuating part of the school to Eastbourne and part to Llandilo in Wales. In 1954 the school celebrated its eightieth birthday and in a grand fete attended by Her Royal Highness the Duchess of Gloucester, £950 was raised for the stage fund. But that was not enough for the indomitable Miss Adams. The school library was small and accommodation for science inadequate. Miss Adams had been cherishing a dream and by 1959 it become reality; the gymnasium was transformed into a magnificent library and thanks to the enthusiasm she engendered, gifts to furnish it and fill its shelves came pouring in. Meanwhile, visionary industrialists raised the Industrial Fund for the Advancement of Science to help to provide laboratory facilities for independent and direct grant schools. Croydon High School benefited and the physics and chemistry block, for which the Fund provided half the money, was opened by Sir Alexander Fleck, Chairman of ICI, on 10 March 1959, the day on which the Margaret Adams Library was opened. So the old and the new were combined and when Miss Adams retired in 1960 her portrait, painted by Edward Halliday, was hung in the library which bore her name and where it remains to this day. Croydon was changing fast and the school continued to grow, amidst increased traffic and the deafening sounds of demolition and mushrooming office blocks. It was clear that a new site would have to be found. On 21 October 1964, the Duchess of Gloucester laid the foundation stone with the Archbishop of Canterbury’s blessing and then in September 1966, the school opened in unfinished buildings on its new green and pleasant site in Selsdon. Progress continued and today we now have, amongst other things, a superbly equipped sports complex, a bespoke sixth-form suite and impressive music and art facilities. Work is currently underway to fully refurbish the Junior School; creating a learning environment that the girls themselves have helped to design. An impressive 4D room has been built and the work on the rest of the Junior School is now virtually complete. In September 2016 work commenced on the new sports pavilion, next to the all-weather astroturf pitch. It was completed in January 2017 and this new facility is available to users of the pitch as well as other hirings. Croydon High School continues to top local league tables in terms of academic results but equally importantly our girls and our alumni are out in the world making a difference in all walks of life. The current Head, Emma Pattison, has a vision and a determination that Miss Neligan and Miss Adams – indeed all her predecessors – would wholeheartedly support. She is committed to building on its proud reputation for developing independent, forward thinking young women, who are well qualified in every sense to take on the challenges of life.